POWER CLEAN multi stage Ultrasonic Cleaning machines are locally manufactured in India. Very easy to use and cost effective. When you need precision cleaning, you need multi-stage cleaning systems. Tank 1 : Pre-Wash : 7" x 7" x 6"
Tank 2 : Ultrasonic : 7" x 7" x 6"
Tank 3 : Rinsing / Vapour : 7" x 7" x 12"
TANK CLEAR SIZE Tank 1 : Pre-Wash : 12" x 7" x 8"
Tank 2 : Ultrasonic : 12" x 7" x 8"
Tank 3 : Rinsing / Vapour : 12" x 7" x 16"
TANK CLEAR SIZE Tank 1 : Pre-Wash : 15" x 11" x 10"
Tank 2 : Ultrasonic : 15" x 11" x 10"
Tank 2 : Rinsing / Vapour : 15" x 11" x 20"
TANK CLEAR SIZE Tank 1 : Pre-Wash : 20" x 12" x 12"
Tank 2 : Ultrasonic : 20" x 12" x 12"
Tank 3 : Rinsing / Vapour : 20" x 12" x 22"
Tank 3 : Rinsing / Vapour : 15" x 11" x 20"
Tank 4 : Dyring : 15" x 11" x 20"
Please Note : We have shown only few selected models. Most of our customers request customed models, like 4 or 5 stage industrial cleaning systems, that include pre-sak tank, wash tank, rinse tank, drying and rust preventive soak tank. Tank 5 : Rust Preventive : 15" x 11" x 20"
Please Note : We have supplied machines all throughout india. 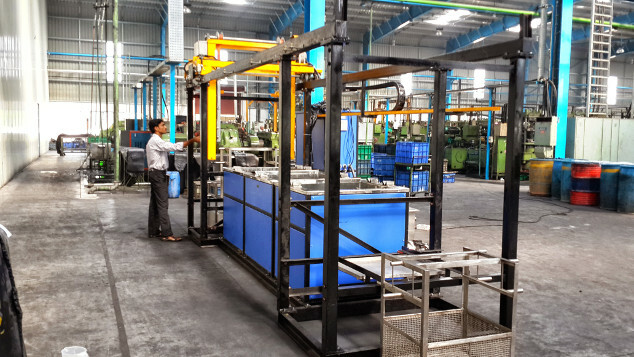 we will be glad to show you one of our commisioned machines are our customer site.